Background and objectives Drug-induced acute interstitial nephritis represents an emerging cause of acute kidney disease, especially among polymedicated elderly patients. Although corticosteroids are frequently used, controversy exists about the timing of initiation, efficacy, safety, and duration of treatment. Design, setting, participants, & measurements We performed a retrospective study of 182 patients with biopsy-proven drug-induced acute interstitial nephritis from 13 Spanish centers. Exposure was defined as the length of corticosteroid treatment. The main outcome was the level of serum creatinine at month 6, with respect to baseline values. Results The most common offending agents were nonsteroidal anti-inflammatory drugs (27%). In 30% of patients, the offending drug could not be identified. The median time to suspected drug withdrawal was 11 days (interquartile range, 5–22). All patients presented with acute kidney disease and were treated with corticosteroids. The mean initial dose of prednisone was 0.8±0.2 mg/kg per day. High-dose corticosteroid treatment was maintained for 2 weeks (interquartile range, 1–4). After 6 months, the mean recovered GFR was 34±26 ml/min per 1.73 m2 and ten patients required maintenance dialysis. Use of high-dose corticosteroids for 3 weeks or treatment duration >8 weeks were not associated with better recovery of kidney function. In the multivariable analysis, delayed onset of steroid treatment (odds ratio, 1.02; 95% confidence interval, 1.0 to 1.04) and the presence of interstitial fibrosis of >50% on the kidney biopsy specimen (odds ratio, 8.7; 95% confidence interval, 2.7 to 27.4) were both associated with serum creatinine level at month 6 of >75%, with respect to baseline values. Conclusions High-dose corticosteroid treatment for 3 weeks or prolonged treatment for >8 weeks were not associated with greater kidney function recovery in drug-induced acute interstitial nephritis. A delay in the initiation of corticosteroids resulted in worse recovery of kidney function. The incidence of biopsy-proven acute interstitial nephritis (AIN) has increased dramatically over the past decade (1) and is probably the third most common cause of acute kidney disease (AKD) in hospitalized patients (2). In the Spanish Registry of Glomerulonephritis, the percentage of biopsy-proven AIN has increased from 3% to 10% in the past 20 years (3). This increase has been observed in all age groups but is most pronounced among the elderly population. In a study of 259 biopsy specimens in elderly patients with AKD, the prevalence of drug-induced AIN was 19% (4). The widespread use of antibiotics, proton-pump inhibitors, and nonsteroidal anti-inflammatory drugs in the general population, and polypharmacy in elderly patients, are some of the possible causes of this increase (5). Identification and withdrawal of the offending drug are the cornerstone for initial management of drug-induced AIN. In fact, kidney function improves after drug discontinuation; however, in a substantial number of patients, kidney function recovery is absent or minimal. Progression to CKD and ESKD are common consequences of drug-induced AIN (6). The efficacy of corticosteroids in the treatment of drug-induced AIN has not been evaluated by prospective, controlled studies. However, they are frequently used in the treatment of drug-induced AIN, and some observational studies have shown a better recovery of kidney function when corticosteroids are initiated early after diagnosis (7). Nevertheless, no studies have addressed the most appropriate dose or duration of corticosteroid treatment for enhancing the recovery of kidney function while avoiding the common side effects associated with corticosteroid administration. This information is relevant, considering the high incidence of drug-induced AIN in elderly people and their special susceptibility to the side effects of corticosteroids. The objective of this multicenter and retrospective study was to analyze a large series of patients with biopsy-proven, drug-induced AIN treated with corticosteroids, to determine the association of length of corticosteroid treatment with recovery of kidney function. We included 182 patients from 13 nephrology departments belonging to the Spanish Glomerular Study Group, with a biopsy-proven diagnosis of drug-induced AIN between 1996 and 2015, who were treated with corticosteroids. This study was approved by the Ethical Committee at the study coordinating center, Hospital Universitario Fundacion Alcorcon. All diagnoses of drug-induced AIN were confirmed by kidney biopsy. Other types of AIN were carefully excluded. The presence of urinary tract obstruction or infection were ruled out. All patients were thoroughly studied to exclude autoimmune disease, such as Sjögren syndrome, IgG4, SLE, etc. Patients with the diagnosis of sarcoidosis and tubulointerstitial nephritis and uveitis syndrome were also excluded. All kidney biopsy specimens were reviewed by the local pathologist at every participating hospital. Histologic diagnosis of AIN was established by the presence of diffuse infiltrates of inflammatory cells into the interstitial compartment, tubulitis, and different degrees of interstitial edema and fibrosis. The cell population of the infiltrate was composed of lymphocytes, monocytes, and eosinophils, often accompanied by small numbers of plasma cells and histiocytes/macrophages. Kidney biopsy specimens with a large number of neutrophils were discarded because of the high probability that they indicated infectious AIN. Although immunofluorescence and electron microscopy are not particularly helpful in making a diagnosis of drug-induced AIN, all biopsy specimens were studied with immunofluorescence and 70% were studied with electron microscopy to rule out autoimmune-mediated AIN. Immunofluorescence studies were negative for immune deposits in all cases. Medical records of all patients were reviewed for this study. All patients had baseline kidney function measured before drug-induced AIN onset, and the median follow-up period was 27 months (interquartile range [IQR], 9–55). Baseline serum creatinine (Scr) was defined as the last value of Scr available in the previous 6 months, as long as this value had not changed by >0.3 mg/dl from previous values. Once identified, the drug responsible for AIN was discontinued in all patients, with the exception of those patients in whom the offending drug could not be identified (30%). The main exposure variable was the duration of treatment with high-dose corticosteroids. The type and doses of treatment were carefully recorded for all patients. After discharge, all patients were followed up at regular intervals until complete kidney recovery or a minimum of 6 months of follow-up. Clinical diagnosis of drug-induced AIN was established at the time of AKD diagnosis. AKD according to Kidney Disease Improving Global Outcomes guidelines (8), was defined as a decrease in GFR by ≥35% or increase in Scr level by >50% for <3 months. The main outcome of the study was Scr level at 6 months with respect to baseline values. Patients were divided into three groups: patients with complete recovery, when Scr level at 6 months did not exceed baseline Scr level by >25%; patients with partial recovery, when Scr level at month 6 exceeded baseline Scr level by 25%–75%; and patients without recovery, when Scr level at month 6 exceeded baseline Scr level by >75% or maintenance dialysis was required. eGFR was calculated by the CKD Epidemiology Collaboration equation. Results are expressed as mean±SD for continuous variables. If the data were not normally distributed, median values with IQRs were reported. For categorical variables, the number affected/total (percentage) were used. For continuous variables for which normal distribution could be assumed, comparisons were made using ANOVA; when normal distribution could not be assumed, we used the nonparametric Mann–Whitney U test or Kruskal–Wallis test. Qualitative variables were analyzed by Fisher and chi-squared test. Statistical significance was defined as P<0.05. To identify the possible factors involved in the nonrecovery of kidney function after drug-induced AIN (<25% glomerular filtration recovered), univariable and multivariable logistic regression were performed. The variables included in the model were selected on the basis of clinical criteria and the results of the univariate analysis. The rule of ten events per dependent variable was followed. To evaluate the performance of the model, the area under the receiver operating characteristic curve was calculated. Demographic, clinical, and analytic characteristics of the patients according to the length of high-dose corticosteroid treatment are shown in Table 1. Mean baseline Scr level was 1.1±0.4 mg/dl and mean eGFR was 68±21 ml/min per 1.73 m2. Baseline eGFR was 60 ml/min per 1.73 m2 or higher in the majority of patients (n=109; 60%; 83±13 ml/min per 1.73 m2), whereas 69 patients (39%) had baseline CKD stage 3 (48±8 ml/min per 1.73 m2) and four patients (2%) had baseline CKD stage 4 (24±4 ml/min per 1.73 m2). AKD was the initial clinical presentation in all patients, and mean maximum Scr level was 5.7±3.5 mg/dl. In 35 patients (19%), acute hemodialysis was required because of the severity of AKD. The most frequent accompanying symptoms were fever (n=33; 18%) and skin rash (n=14; 8%). Peripheral eosinophilia was detected in 45 patients (25%). The classic triad of fever, skin rash, and eosinophilia was observed only in six patients (3%). Sterile leukocytosis (n=135; 74%) and microscopic hematuria (n=99; 54%) were the most common urinary abnormalities. Proteinuria was a common finding, although only six (3%) patients showed nephrotic-range proteinuria (>3.5 g/24 h) at presentation. There were no differences in baseline characteristics according to the duration of treatment with high-dose corticosteroids, except for older age, a greater number of patients treated with intravenous corticosteroids pulses, and a significant lower peak of Scr level among patients receiving the shortest treatment. The most frequent offending drugs were nonsteroidal anti-inflammatory drugs (n=49; 27%), followed by antibiotics (n=41; 22%), and proton-pump inhibitors (n=8; 4%). In 54 patients (30%), it was not possible to identify the offending drug because of the polypharmacy that these patients received and the lack of a clear chronologic association between the onset of any particular treatment and the occurrence of drug-induced AIN. The clinical diagnosis of drug-induced AIN was confirmed in all patients with kidney biopsy results. As shown in Table 1 a significant number of patients showed chronic lesions in the kidney parenchyma: 43 patients (24%) showed >50% fibrosis of the kidney interstitium, and the median number of sclerosed glomeruli was 41% (IQR, 22–60). As shown in Table 2, the median of the interval between drug-induced AIN diagnosis and drug withdrawal (when the drug could be identified) was 11 days (IQR, 6–22), with no significant difference between the groups. All patients were treated with corticosteroids. The mean interval between drug-induced AIN diagnosis and initiation of corticosteroid treatment was 12 days (IQR, 4–22). This interval was significantly longer in patients without recovery of kidney function (29 days; IQR, 12–44) than in patients with complete recovery (9 days; IQR, 3–17) or partial recovery (12 days; IQR, 5–22). The time to start of treatment was associated with time until the offending drug was withdrawn (r=0.48; P<0.001) and time until the kidney biopsy was performed (r=0.83; P<0.001). Additionally, a significant correlation (r=0.31; P=0.007) was found between delay in the onset of corticosteroid treatment and mean Scr level at 6 months (Figure 1). Significant correlation between delay in the onset of corticosteroid treatment and serum creatinine at 6 months. The mean initial dose of corticosteroids was 0.8±0.2 mg/kg per day and this initial dose was maintained for a median time of 2 weeks (IQR, 2–4). Nearly one half of the patients (48%) were treated with intravenous corticosteroid pulses before oral administration. The median of total duration of treatment, including the tapering period, was 9 weeks (IQR, 7–13). As shown in Table 2, there were no differences in initial dose or duration of treatment among the three groups of patients classified according to the percentage of recovery of kidney function. After 6 months of follow-up, the mean recovered GFR was 34±26 ml/min. Seventy-five patients (41%) achieved complete recovery of kidney function, 83 patients (46%) achieved partial recovery, and 24 patients (13%) did not recover kidney function. Within this group, ten patients needed maintenance dialysis. Patients without kidney recovery had a significantly higher Scr value at presentation and more patients in this group required acute hemodialysis. The median time interval between drug-induced AIN diagnosis and the performance of kidney biopsy was 11 days (IQR, 5.75–22). Of note, patients in the nonrecovery group had a nonsignificant trend of longer delay in these events. An inverse relationship between interstitial fibrosis (P<0.001), tubular atrophy (P<0.003), and recovery of kidney function was found. Kidney function recovery occurred nearly exclusively during the first month of evolution in all groups, as observed in Figure 2. Recovery of kidney function during this initial period was associated with final kidney function. 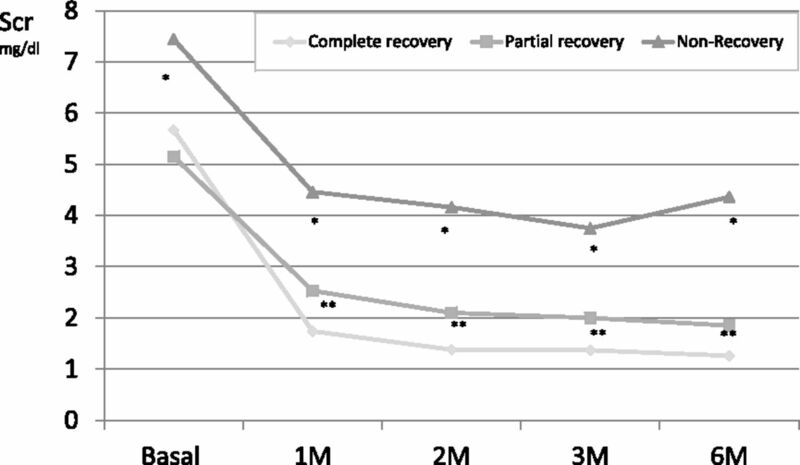 A significantly higher proportion of patients (84%) with complete recovery at month 6 had improved at least 25% of their baseline kidney function during the first month, compared with 52% of patients with partial recovery and 12% of patients without recovery (P<0.001). Changes in serum creatinine according to grade of kidney recovery. Kidney function recovery occurred nearly exclusively during the first month of evolution. *P<0.001, non-recovery group versus partial-complete recovery groups; **P<0.001 partial versus complete recovery. M, month. In the univariable analysis, neither the duration of initial high-dose corticosteroids (odds ratio, 0.94; 95% confidence interval [95% CI], 0.75 to 1.19) nor the total duration of corticosteroid treatment (odds ratio, 1.01; 95% CI, 0.95 to 1.05) showed a significant influence on the nonrecovery of kidney function after drug-induced AIN. In multivariable analysis, the involved factors were the presence of fibrosis of >50% on kidney biopsy specimen and the time to start of corticosteroid treatment. The area under the receiver operating characteristic curve for this model was 0.87 (95% CI, 0.8 to 0.94). Discontinuation of the offending drug is the cornerstone of the treatment of drug-induced AIN (9,10). However, in a substantial number of patients a poor recovery of kidney function is observed after the withdrawal of the offending drug (1), and ESKD is not an uncommon consequence of drug-induced AIN episodes (6). Corticosteroids are frequently used on the basis of several observational studies that showed a greater and faster recovery of kidney function in patients who received them (2,7,11). However, this beneficial influence was not observed in other observational studies, in which treated and untreated patients had similar outcomes in terms of kidney function recovery after several months (12–14). It has been suggested that delayed onset of corticosteroid treatment might be crucial to explaining the lack of efficacy of corticosteroids in some patients with drug-induced AIN. Our previous study (7) suggested that early administration of corticosteroids was associated with a greater recovery of baseline kidney function, whereas a delay in treatment longer than 3 weeks significantly decreased the likelihood of complete kidney function recovery. Therefore, the discordant results previously published about the effect of corticosteroids in drug-induced AIN could be attributable to a delay in the onset of corticosteroid administration. This study corroborates these findings. We analyzed one of the largest series of biopsy-proven drug-induced AIN so far collected: 182 patients, all of them treated with corticosteroids. In our study, the number of patients with early initiation of corticosteroid therapy (before 15 and 21 days after drug-induced AIN diagnosis) was significantly lower in the group who experienced the poorest kidney function recovery compared with the groups with a better kidney outcome (Table 3). In multivariable analysis, a delay in the administration of corticosteroids was significantly associated with worse recovery of kidney function (Table 4). The reasons why a delay in corticosteroid administration has such significant influence on kidney function recovery after drug-induced AIN are not known. In our previous study we suggested, on the basis of some patients in whom a second kidney biopsy was performed, that the poor recovery of kidney function after a delayed onset of corticosteroid treatment could be explained by a rapid transformation of the interstitial infiltrates in areas of irreversible fibrosis in the absence of corticosteroid treatment (15), but specific studies to address this issue are needed. Our study also confirms the change in the epidemiologic features (age, drugs, etc.) of patients with drug-induced AIN reported by previous studies. In contrast to the initial descriptions, which involved younger patients with a predominant etiologic role of antibiotics, our series shows that drug-induced AIN mainly affects elderly patients (mean age, 66±14 years) and suggests drugs other than antibiotics as the possible cause. Similar to recent studies, nonsteroidal anti-inflammatory drugs and proton-pump inhibitors had a prominent etiologic role in our series (16,17). Importantly, the offending drug was not identified in 54 patients (30%), owing to the multiple medications these patients were receiving and the absence of a clear chronologic association between the onset of any particular drug and the occurrence of drug-induced AIN. Clinical and histologic characteristics of patients in whom the type of causative drug could not be determined were similar to those observed in patients with an identified offending drug. Recent studies have highlighted the paucisymptomatic presentation of many patients with drug-induced AIN (18). In agreement with these reports, only 8% of our patients presented with skin rash, fever was detected in 18%, and peripheral eosinophilia was detected in 25%. Non-nephrotic proteinuria and microhematuria were common findings in urinalysis, as well as sterile leukocytosis. However, it is important to note the severity of AKD despite the paucisymptomatic presentation of most patients with drug-induced AIN. The mean peak Scr level was 5.7±3.5 mg/dl and 19% of the patients required acute hemodialysis at presentation. On the other hand, the oligosymptomatic presentation of many patients with drug-induced AIN could delay consideration of this entity and its diagnostic confirmation by kidney biopsy. In our study, median time to kidney biopsy after the diagnosis of drug-induced AIN was 5 days (IQR, 5–22), and had a close and direct association with time to start of corticosteroid treatment. Elderly patients have a special susceptibility to the side effects of corticosteroids. Considering that this type of AKD mainly affects older people, the identification of what should be the ideal duration and dose of corticosteroid therapy in drug-induced AIN is important for clinical practice. Despite the variability in the interval between diagnosis and onset of corticosteroids, the initial dose of prednisone used among patients in our series was very homogeneous (0.8 mg/kg per day). The maintenance of this maximum initial dose beyond 3 weeks does not seem to confer greater probability of kidney function recovery. Our data also suggest that extending total corticosteroid treatment beyond 8 weeks does not ensure a better outcome; on the contrary, it might increase the risk of treatment complications. 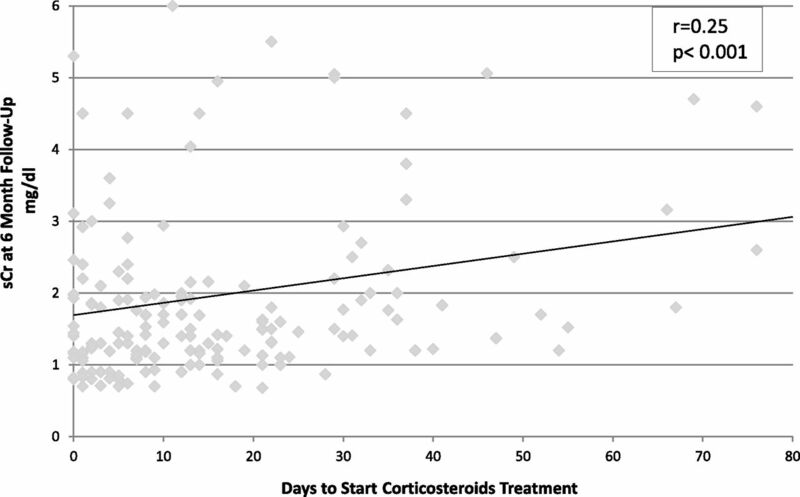 The complete recovery of kidney function after the onset of corticosteroids occurred within the first month in most patients, with very little further improvement during the follow-up period. Therefore, a cycle of high-dose corticosteroids administered until a complete recovery of baseline kidney function is achieved, but not beyond 3 weeks, and followed by a tapering period of 5–6 weeks, seems to be the most recommendable scheme of corticosteroid treatment for most patients with drug-induced AIN. The administration of intravenous corticosteroid pulses before the onset of oral administration was a common practice in our series (48%). However, there were no significant differences regarding the recovery of kidney function between patients who received steroid pulses and those who did not. Therefore, no conclusions can be drawn supporting a possible beneficial effect of such a therapeutic measure. Additionally to a delayed onset of corticosteroid treatment, the presence of interstitial fibrosis >50% on kidney biopsy specimen was found as a significant risk factor for worse recovery of kidney function by multivariable analysis (Table 4). However, we could not identify among these patients a threshold from which corticosteroid therapy could be considered futile. Even when extensive fibrosis was found in the kidney biopsy specimen, early treatment with corticosteroids was helpful in recovering glomerular filtration in some patients. The study has some significant limitations: its retrospective design, lack of a nonsteroidal control group, noncentral review of the kidney biopsy specimen, and the large number of patients in whom the identification of the offending drug was not possible. On the other hand, the study has some important strengths, including the large number of patients included; the close follow-up of the patients; and the availability of clinical, analytic, and histologic data for all patients. In conclusion, our data suggest that after having withdrawn the offending drug, early treatment with corticosteroids achieves a higher rate of recovery of kidney function in drug-induced AIN. This beneficial effect happened even in patients with evidence of fibrosis on kidney biopsy specimen. The maintenance of high-dose corticosteroid therapy for longer than 3 weeks, or a tapering period beyond 5–6 weeks (whole steroid therapy prolonged for >8 weeks), did not confer greater kidney function recovery. We thank Carolina Morales Alvárez for grammatical review of the manuscript. Work in this report was funded by Red de Investigacion Renal (grant RD016/0021 [to M.P. ]), Instituto de Salud Carlos III, Spain. The study was approved by the Ethical Committee at the Study Coordinating Centre, Hospital Universitario Fundacion Alcorcon, Alcorcon, Spain. See related editorial, “Treatment of Drug-Induced Acute Tubulointerstitial Nephritis: The Search for Better Evidence,” on pages 1785–1787.